OK, technically it’s not really mental illness if it works, (or if Cthulhu* demands it be done)! In my happy quest to make the best coffee possible, I’ve gone to what the casual coffee drinker might call extensive measures. I use a French Press, filtered water, fresh, whole beans, and in the past few months, a hand-cranked ceramic burr grinder. That last purchase proved wise as it produces a grind much more consistent grind, (key to any extraction process, than an electric blade grinder, . However, I could still detect tiny particles in the bottom of my cup, particles that release bitter flavors after a few minutes. Many respectable baristas have stopped using the French Press as the device’s screen doesn’t sufficiently remove all the smaller bits of grind that will, not can, make your coffee detectably bitter.Those small, often dust-like particles also affect the “clarity” of coffee, something I admit I could care less about at 0500 when I’m simply trying to not hurt myself while brewing coffee. 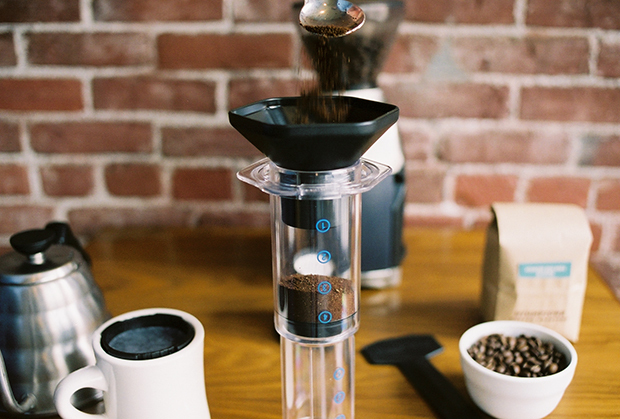 Still, it’s a factor that is driving the use of Aeropress, a very inexpensive, polymer tube that uses a silver dollar sized paper filter to eliminate all grind particles. 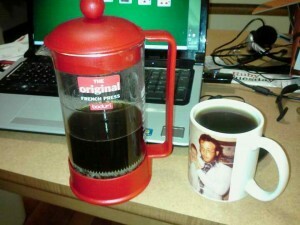 I’m emotionally attached to not only my French Press, but to the process that goes into making coffee. Pipe smokers no doubt understand the relaxing routine that goes into the several simple steps of making a great cup of coffee. I’m also quite fond of the style a French Press brings, and quite frankly, the Aeropress is devoid of aesthetic qualities. 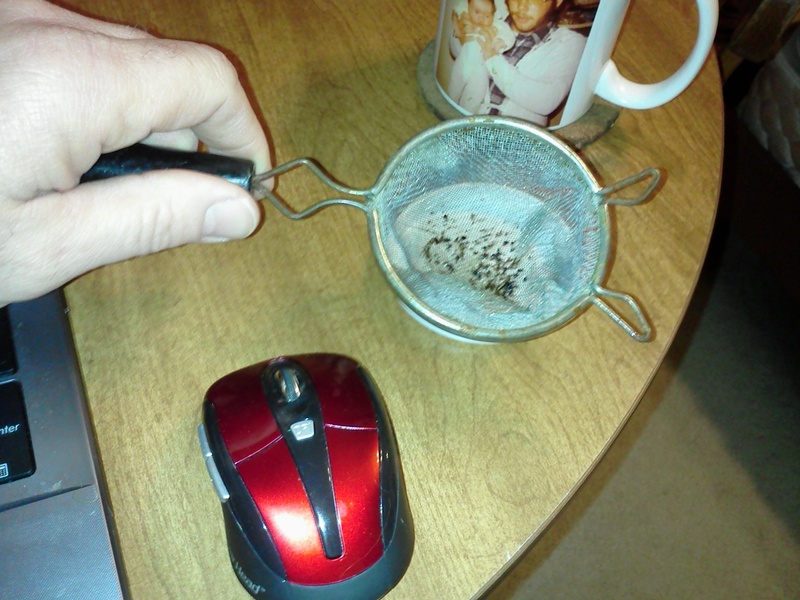 Still, I know – I see – evidence that my coffee could be better. No larger than black powder grains, the small bits of now-trapped coffee won’t make my brew bitter. Rifling through a kitchen draw last week, I noticed a seldom used gadget tucked among an apple corer, a nut cracker and a wire cheese slicer. In an instant I saw its coffee application! 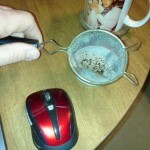 The weathered, small, fine-mesh strainer was coincidentally the same diameter as my favorite coffee mug. By pouring my freshly pressed brew through the strainer, most of the small particles are trapped and I can honestly say I notice a smoother effect since I added the step. Sadly, I must admit to seeing some sediment at the bottom of my mug. The remaining powder not caught by the mesh filter on my press or by the wire strainer is an improvement, no doubt, but knowing it can be better poses a dilemma. At $25 or so, the Aeropress, with its insipid appearance, does provide a superior clarity with no residual coffee bean material in the brew. The very though, however, of using this device is, for me, akin to seeing Sherlock Holmes discarding his calabash in favor of a crack pipe. As I’m hardly the type who’d notice a single pea beneath my mattress, I’m sure I’ll keep my beloved French Press as my device of choice for morning coffee. As I see coffee first and foremost as a civilizing custom both to be shared with great company or relished in private, I can see the Aeropress being a fun conversation topic that just happens to make a superior cup of coffee. However, the Aeropress will never hold a place of honor as does my French Press. It just wouldn’t be right. 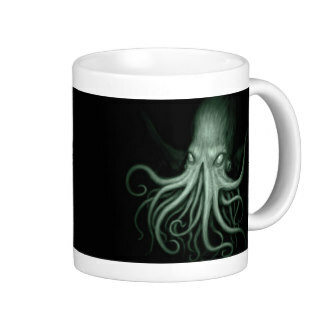 * Cthulhu is a fictional, (yeah, right), being created by horror master H.P. Lovecraft. I only recently discovered the Cthulhu’s image closely associated with coffee.